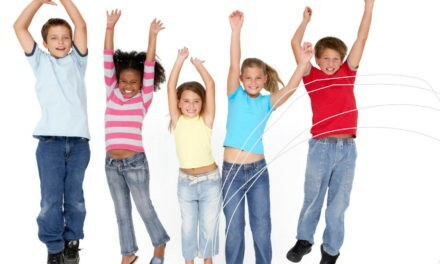 Inactivity has become a major health problem for Canadian children. Only five percent of Canadian kids accumulate at least 60 minutes of moderate- to- vigorous physical activity daily. While there is no singular cause or silver bullet solution, one of the contributing factors to inactivity is related to the increased time that kids spend in sedentary behaviours, especially in front of screens. Canadian kids spend an average of seven hours and 48 minutes a day in front of television, video games, smartphones and computer screens. Over the course of a week that is more time than their parents spend at work! 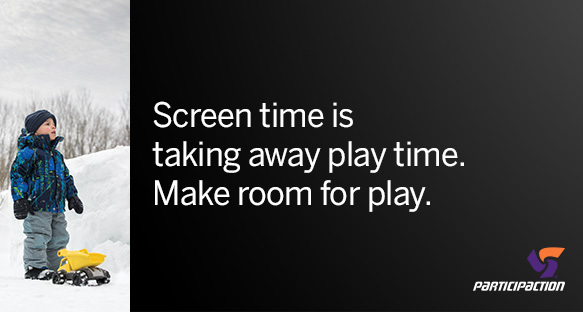 In January 2015, ParticipACTION launched a new campaign to increase awareness about how screen time is taking away play time.The campaign includes a series of 30 second videos that grab parents’ attention and makes them think about their own family’s screen time habits at the expense of active play time. 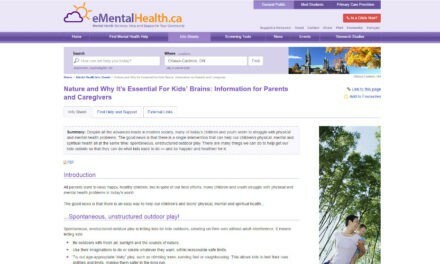 Solution-oriented content that helps parents wrestle control back over screens within the family setting, and inspirational content that enables parents to play an active role in helping their kids get the physical activity they need to be healthy and happy, are available on the website and social media channels. We all need to play a part in encouraging Canada’s kids to be as active as possible – to make room for play by turning virtual play into real, active play! Click here to learn more about the campaign and what you can do to help spread the word.